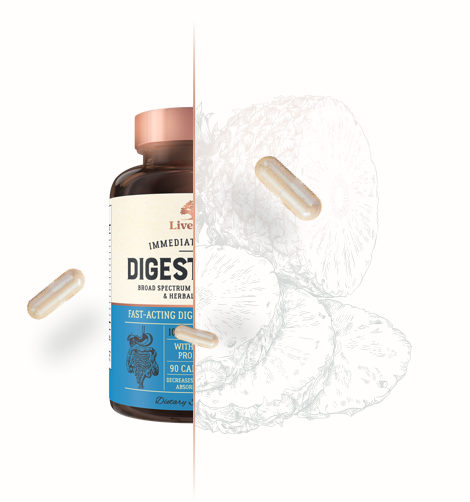 Livewell DigestWell ™ contains 10 broad spectrum, plant-based digestive enzymes to help your body absorb key nutrients more effectively and support proper digestion. The addition of the clinically studied probiotic DE111® and powerful botanicals, ginger, fennel, and peppermint, all clinically proven to aid in digestion, also bring quick relief to the uncomfortable symptoms related to indigestion, so you can live well. Clinically proven to aid in digestion, brings quick relief to the uncomfortable symptoms related to indigestion, so you can live well. Our digestive system employs roughly 22 different digestive enzymes, at any given time, to help us break down our food into important nutrients. These enzymes assist specific processes to strengthen and elevate nutritional absorption and performance. 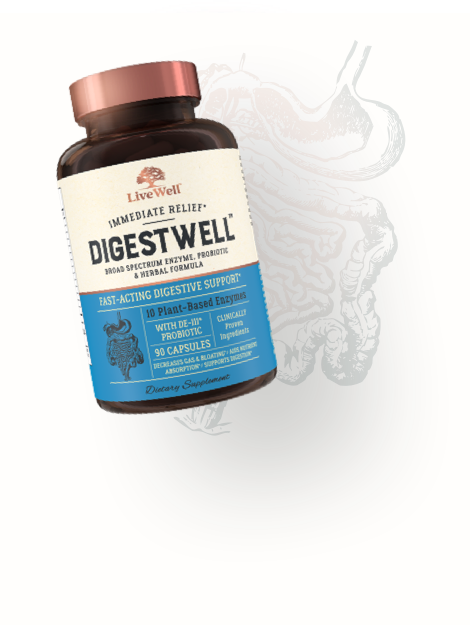 Key plant-based enzymes such as bromelain from pineapple and papain from papaya, as well as intestinal enzymes, amylase, glucoamylase, cellulase, protease, lactase, lipase, and hemicellulase are integral to aiding digestion, which is why DigestWell combines all of these are more into one broad spectrum enzyme formula. These high potency enzymes are designed to help you digest fats, proteins, carbs, and sugars, reduce bloating and cramping, and improve long-term gut health. Along with the support of ginger extract, fennel seed powder, and peppermint leaf extract, this formula soothes discomfort and boosts the body’s ability to generously nourish each of its vital systems. Lastly, the addition of the clinically studied and patented probiotic strain, DE111® Bacillus subtilis, supports the growth of good bacteria in the gut, helping to crowd out undesirable bacteria and promote proper digestion.